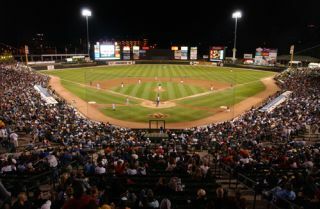 Frontier Field, home to the minor league baseball's Rochester Red Wings, will upgrade to a new LED video display designed and manufactured by Daktronics of Brookings, S.D. The display will be installed in the spring of 2014 in Rochester, N.Y.
"We strive to make sure that our fans have a great experience whenever they visit Frontier Field and the addition of our new Daktronics video board will undoubtedly enhance that experience at the ballpark," said Rochester Red Wings General Manager Dan Mason. "We look forward to making our games even more exciting, giving our fans even more reason to cheer, and engaging our fans more than ever while they are at Frontier Field." The new video display will measure approximately 24 feet high by 33 feet wide and will feature a 15 HD pixel layout. It is capable of showing one large image to highlight live video and instant replays. It can also be divided into separate windows to show a variety of vivid graphics, colorful animations, up-to-the-minute statistics, scoring information and sponsor advertisements. Frontier Field's new display will incorporate image clarity and contrast with wide angle visibility while providing multiple levels of protection from the elements guaranteeing every fan a chance to stay updated with game information. Red Wings fans will stay informed with Daktronics powerful DakStats software MLB package. DakStats software is suitable for managing game, season and career statistics. The software delivers and tracks statistics and in-depth statistical reports for all levels of play – from high school to professional. The installation also includes Daktronics powerful Show Control System, which provides a combination of display control software, video processing, data integration and playback hardware that forms a user-friendly production solution.